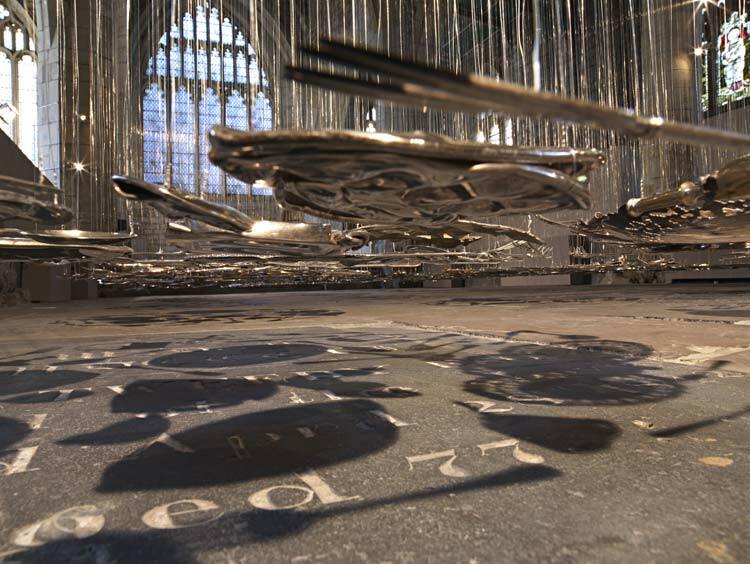 Cornelia Parker’s work is new to me, having only just caught her Thirty Pieces of Silver at York St. Mary’s last week, before take down on 30th October. I am a Cornelia convert. Her work was recommended to me, following a conversation about my own art practice. I see many similarities in process, although I have much to work on re: pairing things down, simplicity and fruition of ideas. Whilst you find my last post discussing a found photographic inventory of silver, it is of particular interest to me that Parker directly sabotages the intrinsic value of existing silver items with such liberating effect. The installation, no mean feat of engineering, is complimented by the environment, not merely with regard to the religious implications suggested by the title, but sensually – the silver and stone surroundings mutually absorb and emit the dappled rays of spare autumnal light shining through the leaded and stained glass windows. Similar to the magical effects of music, the sun allows what I believe to be a mirage of movement. The “pools” of silver, as Parker calls each circular gathering of steam-rollered silver, are suspended tautly from the ceiling, I suspect don’t actually move and hover rigidly about a foot from the former church’s interior gravestones. The wires themselves create a ghostly line drawing that emanates from the heavens. I noted whilst viewing the work, that broadly speaking, each individual silver item whilst allocated a function was formerly, in reality, a showpiece. Rather than silver used as functional items around the home – they mostly serve to display status. Maybe I have hung around in lesser social echelons, but I can say that it is unlikely that I have eaten from a silver platter etc. Parker has discarded “worth” in favour of transformation and I will reiterate that the space allows for particular reflection (quite literally owing to the mirror like quality of light that shines forth from each items’ folds, dimples and crumples) on how the work communicates the killing off of a set of values (class pretension, personal possession). I believe Thirty Pieces of Silver encourages the viewer to take stock of our position within a consumerist and mass media driven society and challenges us to see how resurrection in different guises is possible if we collectively push for it.